Most people experiencing such persecution would encounter thoughts of confusion, anger and denial. Such encounters are very difficult to understand and the temptation to irrational and confused thinking would be strong. So what was going through the mind of our Blessed Mother? Mother Mary not only had an Immaculate Heart, she also had a mind that was sharpened with the perfection of faith. In her faith she may not have had the same knowledge and understanding as she has now in Heaven, but her faith was such that she knew this horror was permitted by the will of the Father. Her mind would have grasped the deepest truth that her Son was fulfilling His divine mission. She would have known that this tragedy was not a tragedy at all; rather, it was the greatest act of love ever known. Mother Mary’s faith would have mixed with the pain she felt in that moment. Her faith would have been a source of great confidence as she was tempted to despair. Her faith would have transformed all temptations into clarity and conviction. In the end, she would have conquered her temptations by the truth revealed to her from the mind of God. In our own lives, suffering leaves us confused and uncertain. It tempts us to lose faith and to doubt the perfect will of the Father in Heaven. We must learn from the witness of our Blessed Mother as she allowed the truth to direct her thinking as she faced her Son’s suffering. Only the truth could set her free to understand and shed every temptation to doubt the wisdom of God. Reflect, today, upon the perfect faith of our Blessed Mother. Her faith was an absolutely certain knowledge that God was in control and that the will of the Father was being achieved before her very eyes. Worldly wisdom was left with an impossible task of making sense of such cruelty. But Heavenly wisdom took over as she consented to the death of her Son for the salvation of the World. Dear Mother, so many times in life I am tempted to doubt the ways of God. My own crosses, and those of my loved ones, can leave me confused. Pray for me that I may have your perfect faith as I go through this world of suffering and pain. May I never be deterred by the temptations that come from worldly wisdom alone, but instead allow the truth of Heavenly wisdom to flood my mind and give direction to my life. 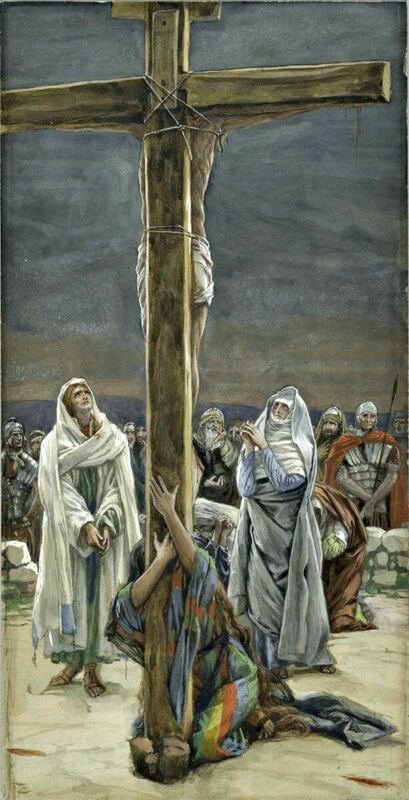 Precious Jesus, You allowed Your Immaculate Mother to witness the excruciating pain of Your Cross. But You also bestowed upon her Heavenly insight and knowledge so as to help bring clarity to her mind. Pour forth this same knowledge upon me and upon all mankind. Help us to know You and Your perfect will in all things.